In addition to the 388 charity registrations permitted by the Maratona's regulations, an additional 70 higher-priced registrations will also be up for grabs; half on 28thNovember 2018 and half on 28th March 2019. There will be 40 Gold registrations at a price of €250 and 30 Platinum registrations at a price of €500. All proceeds from these 70 registrations will go to the two municipalities: a small contribution to help these magnificent places get back to normality. On 28th November the first 35 of the 70 registrations were sold. In addition to the 35 planned, additional 4 Crystal registrations at the price of €1.500 each have been sold. In March there will still be possible to buy 35 entries. The draw for the starting places of the 33rd edition of the Maratona dles Dolomites-Enel took place in front of a notary. Click HERE to see the participant list. Some useful advices to find an accomodation. 194 Charity entries online on November 28th 2018. Selle Italia is one of the Maratona's historic partners: it’s been racing with us for more than twenty years. We recently renewed our sponsorship contract for another three years. For us, it is a source of great satisfaction that we can count on and partner with an Italian company that so successfully promotes “Made in Italy” throughout the world, exporting quality, innovation and ideas that are always cutting-edge. The pre-registrations for the Maratona dles Dolomites – Enel 2019 are closed. The draw will take place in the second half of November 2018. All participants admitted to the draw are listed HERE. One day after the draw the updated list with all participants admitted to the race will be published on our website. THE MARATONA DLES DOLOMITES - ENEL 2019 IS ONLINE! 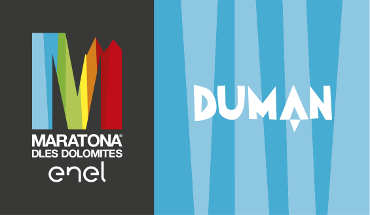 Here you can find all the information and news to access the 33rd edition of the Maratona dles Dolomites - Enel of July 7th 2019. Theme of this edition will be TOMORROW. One of the most important new features of the next edition will be the return of the repêchage, giving applicants the certainty of taking part in the Maratona a certain number of years after their request. A survey was carried out in November last year to ask Maratona enthusiasts whether or not they'd like to see the repêchage reintroduced, and more than 8,000 people replied. 90% of those who took part in the survey were in favour of the repêchage, so it was decided to reintroduce it from the next edition, guaranteeing applicants the certainty of taking part within six years. Six years may seem a lot, but the huge demand to participate in this event leaves no other choice. Hurry, the last outfits of the 32nd edition of the Maratona dles Dolomites-Enel by Castelli and Kask can be found on the All4Cycling.com website. Subscribe the Maratona newsletter to stay always up to date. How to follow the #mdd32 online! EAT GOOD AND RUN BETTER! REHYDRATES, ENERGIZES, REDUCES TIREDNESS AND FATIGUE. THE START NUMBERS HAVE BEEN ASSIGNED! PANARIAGROUP, high quality solutions for any residential, commercial or public architectural need.